My Snowfall Records series continues below... Currently, we are about to experience the coldest air we've had in 10 months. 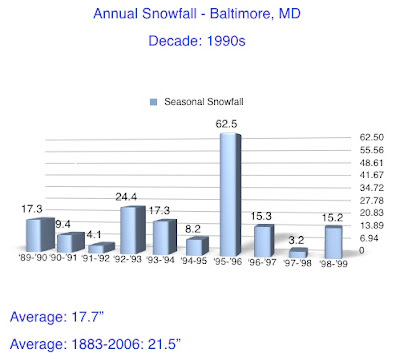 March 7th, '07 was the last time we failed to reach 30F at BWI. Tomorrow will likely stay that cold as well, while overnight lows drop into the teens- even downtown. For contrast- our record high on this date was 71F, way back in 1876. Yes it was warm in January two centuries ago. As for flurries, not the best upper level support with this trough- as we look at the 500mb level for a strong vort max. It will pass well to our south, but the unstable cold air will help clouds develop... only marginal support for flurries or a stray snow shower. Western MD and the ski areas of WV and PA will get a few beneficial inches. The back edge of this trough will swing through tomorrow morning with a small chance of another flurry. This is the decade where things get interesting. If you have not seen the rest of the series, continue to scroll down or search for previous posts over the past week. 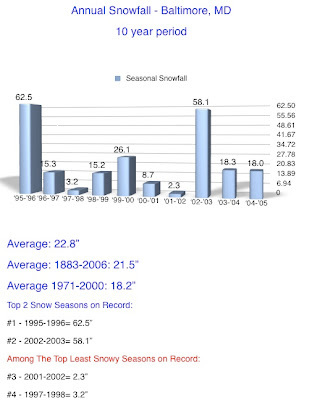 The 1990s shows a range of seasonal snows from the #1 Record ending in 1996 with 62.5" to the 3rd least snow two years later in 1998 with 3.2". We can attribute a strong El Nino to the record snow, and return to La Nina during the low snow years of '91-'92 & '97-'98. The decade itself averaged about 3 inches below the long term average, yet near the 30 year average.